Kids love the outdoors, and as a parent, you’ll want to make the most of your garden or the outdoors. To help and inspire you, we’ve put together a selection of some of the best family blogs we’ve found. We’ve got green fingered parents, dads and mums who don’t like mowing, and families who venture beyond the back garden for their dose of fresh air and sunshine. Find out what goes on over the garden fence! Would you guess this was fake grass? Artificial grass has come a long way since green grocers draped their stalls with it. Check out blogger Katie's back garden makeover to see just how effective it is. She says: “I know it is not for everyone, especially the green fingered amongst us, but...it effectively makes your garden another room albeit outside”. Mum of three, Katie and husband Jon bring you the best in family blogging with plenty of life hacks to help and inspire. Think having a young family rules out international travel? Katie and tribe are just back from their California road trip. The pics are awesome. If you’ve ever dreamed of creating a ‘she shed’, a space in the garden just for you, you’ve come to the right place. Follow Caro’s progress as she and her partner transform a standard garden shed into the perfect place to work and chill. A perfect example of what a DIY-savvy couple can achieve, you’ll love the photos which offer a step-by-step guide to the build and conversion. Hint: It’s all about getting the shed base right. Mum to twin boys, three cats and four chickens, Caro writes with wit and wisdom. “With so much time and effort spent on the inside of the home, it can be easy to forget about the outside”, says blogger Bek. The mum of two recommends you take a look at your front door. First impressions count, so give it a lick of paint says Bek, and while you’re at it the kids will love, sprucing up your plant pots. A superb family blog, you’ll find so much support here. Sometimes feel like you’re underperforming as a parent? Let Bek give you the reassurance you need; visit her ‘How to be a good enough parent’ case study. Two-year-old Lucas can already “work his way round our phones, the TV and our iPads,” says blogger Jenni. That’s why no matter what the weather, she wraps up warm and takes her little boy outside to play – find out what the experts say about the importance of outdoor time. While Jenni loves blogging about family life with her little boy, she still needs to keep the pennies rolling in. With that in mind, you might be interested to know that Jenni works as a virtual assistant. What a great idea. Check out her blog to find out more. How’s this for an incredible family garden? 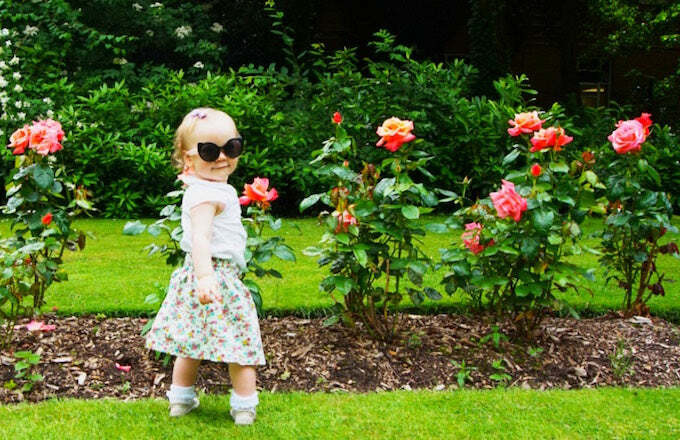 “We wanted our garden to be a space that we could all enjoy as a family”, says blogger Steph. That’s why dividing the space into distinct areas works so well: The kids can play, while Mum and Dad relax on the patio. Check out the before photos to see just what a transformation this is. If you’re a mum or dad, you’ll know just how far family budgets have to stretch. Renovation Bay-Bee, helps you towards a beautiful home without breaking the bank. Like the minimalist look? Find out how to create the vibe on a shoestring. With a lawn full of tree roots and more weeds than grass, blogger Jemma had her work cut out creating her family’s first ever veg garden – the ‘before’ picture shows just how daunting the task was. Moving to their ‘forever home’ was a dream come true for, this mum, dad and four children, but as always the reality was daunting. You’ll love Jemma’s account of family life, and home renovation. Need to keep the kids busy while you crack on? Jemma swears by busy bags. You know your garden’s a jungle when you have to get the tree surgeons in just to make a bit of room. Mum and blogger, Becky wasn’t impressed by the estate agent’s photos of the multi-tiered garden of the family home she and her partner have since bought. She says it was only when she visited that she could see the potential. If food, family, and creative interiors and exteriors are your thing, this is the blog for you. Renovating your kitchen? Becky’s cost breakdown is an eye-opener. If your garden’s a touch on the small side, consider planting your veg in pots says family blogger Kay. Having recently become a vegetarian, she’s become much more interested in where her family’s food comes from. Check out her blog to find out what she’s planning to sow. Two small children, plus the anxiety that comes with being a parent can make life stressful. If that sounds like you, Kay’s advice on mindfulness for parents will prove invaluable. A blogger who talks candidly about the stresses of modern parenthood, Kay will help you stay positive. What better way to enthuse little ones about gardens and the great outdoors than by taking them on a colour hunt. Take a trip with blogger Deborah as she and son Noah search out all things bright and beautiful at Lydney Park near Chepstow. An expert in creating family adventures kids will cherish for a lifetime, Deborah – mum to seven – is one of the most creative bloggers we’ve ever come across. Check out this Magical Memory Bank Train ride – what a way to jazz up a train journey! Spending time with nature is an essential part of growing up! Spend half an hour in nature and you’ll feel regenerated says Corporate Dad, Phill. That’s why your garden is so important. Find out how to make the most of yours with Phill's top tips. Short of time to mow? His sound advice is to plant a camomile lawn or wildflower meadow. When he’s not musing on modern fatherhood, Corporate Dad provides a useful repository of ‘man skills’ that are sure to come in handy – like knowing which plumbing tools to get. A useful, insightful blog. You’ll love this one. How do you make your garden work for all the family? Do let us know via our Facebook page.